When we say Raw Talent is one of the best and most exciting youth theatres in Birmingham we mean it, but don’t just take our word for it. Here are some testimonials about Raw Talent from parents and former members of the drama group. They’re “Simply The Best”! Is just one of the many popular-culture references that your child might say during a Raw Talent performance. Sometimes in life we are lucky enough to have but a few milestones that propel us both personally and professionally. Being in Raw Talent was one of mine. Words genuinely can not express how much being apart of this family means to me. Some of the best times of my life have been spent with these amazing people. The founders, Claire Downes and Stuart Lane are two exceptional human beings, that offer an incomparable experience for young people looking not only be involved with the arts but simply to be a part of something special. So please don’t even consider the rest. Go with the best. Be a part of the Raw Talent Family. Raw Talent inspire children to become more confident in themselves AND when on stage and performing. No child is favoured over others, each child is heard and valued equally. They nurture their members by having fun when acting. Great bunch of people. This is a fantastic Drama club for all kids- younger ones and teenagers! Through fun Drama activities and performances, the children’s self confidence and ability to act zooms! Totally inclusive and my kids love it! The team are fabulous at getting the best out of each and every child.👊Raw Talent rocks! This great group are such a happy bunch of kids, funny, committed and really focused on stage. They are a joy to watch performing! Raw Talent have provided excellent opportunities for my 3 children and endless hours of fun filled entertainment for all the family. I am proud to be associated with the team! One of my clearest memories of show day was we used to do what I think we called a Spanish Run (or is that an unfortunate form or diarrhoea?) where we had to do the whole show at triple speed. We always made a ton of mistakes but the result was usually the best run we’d done so far. As a teacher now in my twenties, my years in Raw Talent taught me that the most important things when standing in front of a bunch of people are your energy and presence: if you’ve got that you can basically get away with anything. My Mum observed when dropping me off that: ‘You’re all such misfits…” and looking back we really were. The “Raw” bit of Raw Talent isn’t there for show. This isn’t the theatre group to send your kid to if you want them to be preened or to make them feel like a superstar (try the one where you have to pay £400 and wear tights). I was put in my place a few times when I got above my station, again lessons that have served me well. But if you want your kid to learn to laugh at themself, to learn all the words to Minnie Ripperton, work with people who have made it to the top of their game and make friends they’ll still be in touch with in 15 years, then it’s the only choice. Yeah they have the amazing costumes and whizz bang productions that equal the other stage schools, but they excel at developing kids who can hold their own on a stage with nothing but themselves. Great shows especially when they introduced the singing groups. 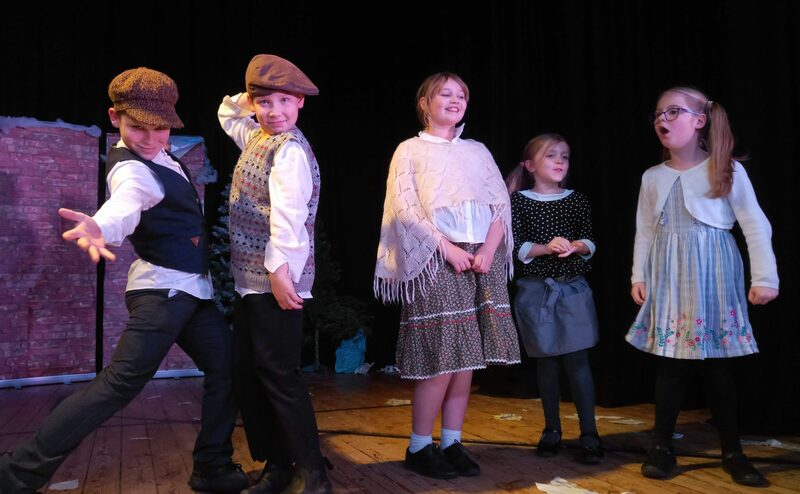 Gives the children involved a fabulous experience of the arts and using their imagination. They also have exposure to external work in the industry.